Spring seems to be a good season to launch flagship devices, and lots of phone makers are doing it. To make a point, last week we saw Huawei unveil its P8 handset during a press event, and this week, quite unexpectedly, Sony has pulled the veil off the Xperia Z4. But the Japanese tech giant didn't do it with bells and whistles and contented itself with rolling out its latest flagship device via a press release where we’re given the hard, cold facts. No fancy media event involved. If you’re a bit confused by the flagship avalanche and you’re wondering which smartphone model might be worth your buck, we’re here to offer you a detailed comparison between the two new top-tier devices. The Huawei P8 arrives with a metal unibody similar to what you’ve seen with the iPhone 6 and HTC One M9. But Huawei ditched the subtle curvature in order to offer a device that’s rectangular in shape, which actually makes holding it in your hand a bit awkward. Unlike other phone makers (Samsung immediately comes to mind), Huawei hasn't ventured in any new territory while its design schematics are concerned, and that might be a good thing for those who love the way the company does things. The phone comes with a relatively thin body of 7.5 mm / 0.25 inches (although the Sony phone beats it) and a weight of 144 g / 0.31 lbs. As for the new Sony Xperia Z4, the phone is extremely similar to its predecessor, the Z3. It comes with a metal frame and a glass body that hides the fairly large battery. However, compared to the previous model, the Xperia Z4 is a tad slimmer, coming at 6.9 mm / 0.27 inches, and a bit lighter at 144 g / 0.31 lbs (its predecessor tipped the scales at 152 g / 0.33 lbs). Huawei is a very well-known proponent of FHD displays on smartphones, so the P8 arrives with a 5.2-inch screen with 1920 x 1080 pixel resolution. The company claims that, this way, the battery life won’t be subjected to too much strain. Meanwhile, Sony’s new Xperia Z4 utilizes the same display standard. The phones are identical in size, meaning the Xperia Z4 also comes with a 5.2-inch display with FHD res. However, if we’re to listen to the rumor mill, Sony will also push out a QHD version, as the market’s standard dictates today. Well, the Huawei P8 brings something quite interesting in the photo department. The camera sensor inside the new flagship works with four types of sub-pixels including Red, Green, Blue and White. This setup should make the snapper mode efficient in low-lighting environments. The 13MP main shooter benefits from optical image stabilization and can rotate up to 1.6° which is double than what the iPhone 6 Plus camera can do. The selfie-centric camera is of a 8MP variety. The image processor inside the shooter will apparently be able to bestow DSLR quality to the images, but such statements are yet to be verified. As for the Sony Xperia Z4, the main camera is a bit more impressive, being of a 20.7MP capacity with 4K video capabilities, exactly as the one on the Z3. Up in front we find a 5.1MP camera for video calls and selfies. In the hardware department, the Huawei P8 takes advantage of the company’s home-grown HiSilicone Kirin 930 chip with 2GHz octa-core CPU on the inside, fitted with 3GB of RAM and 16GB of internal storage. A negative point here is that the flagship lacks a microSD slot for storage expansion. Just like the Samsung Galaxy S6, the P8 doesn't offer a user replaceable battery. However, if you prefer something more traditional in terms of silicone, the Xperia Z4 has a Snapdragon 810 processor running under its hood (like on the HTC One M9) fitted with the same 3GB of RAM and 32GB of internal storage. The good news is that, even if the rumor mill whispered at some point that the Xperia Z4 might be losing its microSD card slot in the vein of the Galaxy S6, this didn't prove to be the case. So luckily, those needing more storage will be able to increase it via microSD up to 128GB. We should also mention that Sony’s smartphone is IP67-certified for dust, and also IP5 and IP8-certified for water. Both flagships run Android 5.0 out of the box, but the Huawei P8 has the company’s EMUI 3.1 UI plastered on top, which brings along an interesting feature. It’s called Knuckle Gestures and allows users to double tap with their knuckles on the screen and take a screenshot. They can also crop it out with help from their knuckles. Albeit we’re not told in the press release, Sony is probably bundling its phone with its usual skin that is riddled with lots of extra applications and features. If this is a good thing or not, it’s up for users to decide. 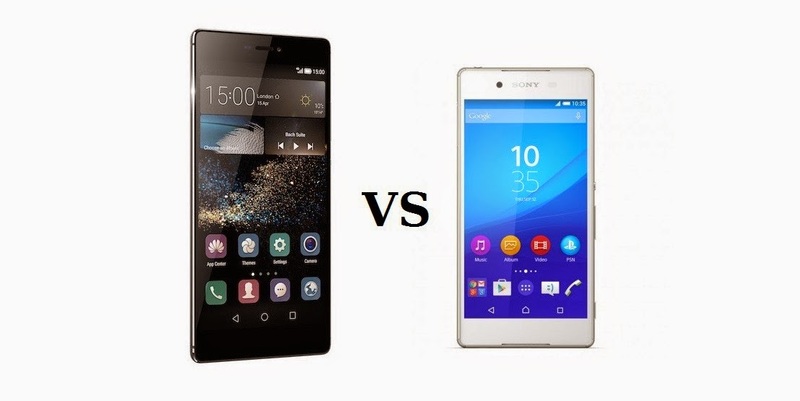 The Huawei P8 runs on a 2,680 mAh battery, while the Sony Xperia Z4 is sustained by a tad larger 2,930 mAh battery, but neither has been rated by their respective manufacturer. So at this moment, we can’t tell you anything about how long the phones can survive on a single charge. The Huawei P8 will be available in four colors including Mystic Champagne, Prestige Gold, Titanium Gray and Carbon Black. The 16GB model will go on sale in Europe around May for a price of €499 / $530. The 64GB variant will start selling for €599 / $635. As for the Sony Xperia Z4, the company is offering it in Aqua Green, Black, Copper and White versions. The handset will go on sale later this summer in Japan only, and Sony kept mum about pricing specifications.